The store in Val San Nicolò is reachable only on foot and the hike takes approximately 2 hours. The gems sold inside are worth the hustle though. The North Face managed to secure collectable items worn by such explorers like Conrad Anker, Alex Honnold, Caroline Ciavaldini, and Simone Moro. Every item sold will be accompanied with a personal message for the new owner encouraging them to “never stop exploring”. Items will be sold in the store for eight days, and the remaining collectables will be offered at an online auction. 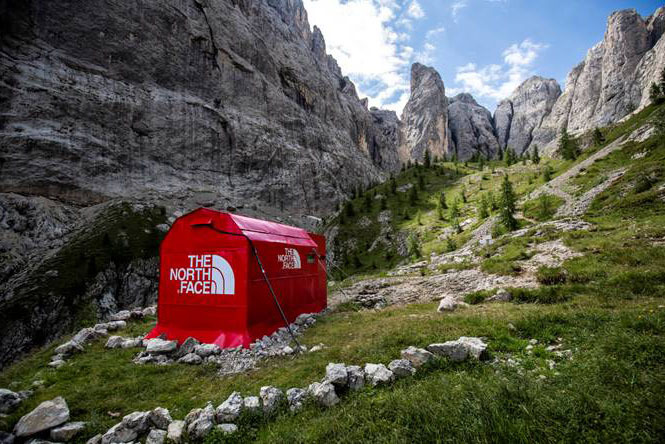 The opening of the pop-up store kicked off The North Face’s Pinnacle Project – an initiative that aims to invite “rebellious spirits to unite in exploration through outdoors, fashion, design and music” and will travel to Berlin and Manchester in the autumn.